Oil on canvas, 26 x 34 cm (10.2 by 13.4 in). Unsigned. Beautiful and preciously framed in style of the late Italian Baroque. From F.G.Conzen manufactory, well known for quality hand-finished frames. Dimensions framed: 34, 5 x 41, 5 cm (13.6 by 16.3 in). 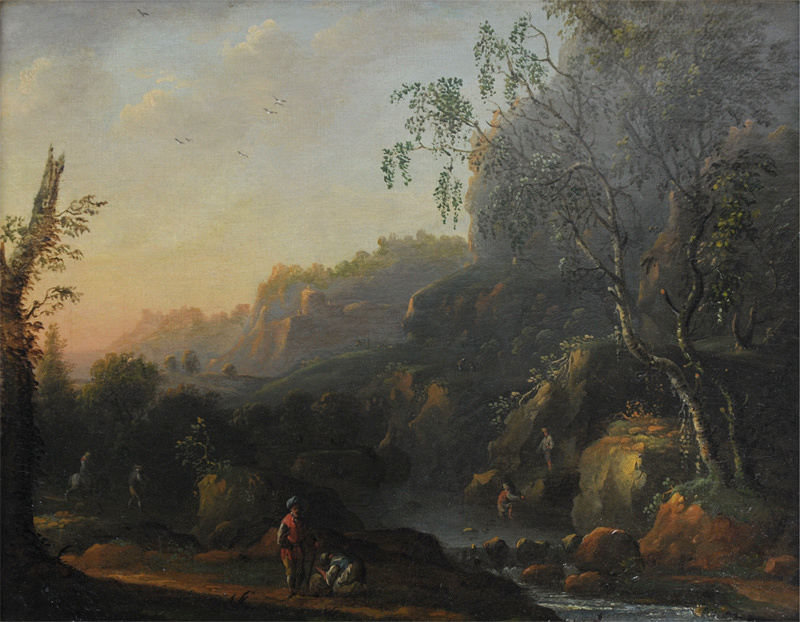 Impressive small classical upper Italian landscape of the early 18th Century, idealized with rich vegetation, peasants with a mule, some fishing persons at the river and resting travelers at the foreground. Delicately set clouds, atmospherically distance effects with bright southern sunset at the vanishing points and fine-scaled trees, which remember of Paul Bril. 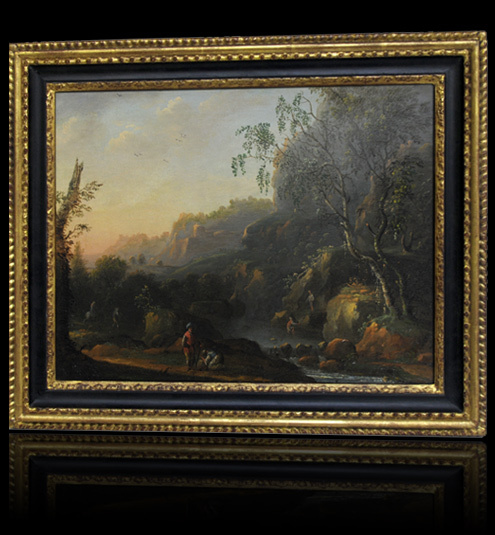 Belonged originally presumably to a series of small Italian landscapes. Literature: Thieme-Becker, vol XXXII, p. 339-341; Luigi Salerno, Pittori de Passaggio del Seicento a Roma, vol II, pp 410-423, vol III, pp 1085-89. We are grateful to Dr. Sylvia Schuster, Vienna; Dr. Anne Charlotte Steland (dissertation about Herman van Swanevelt), Göttingen, Dr. Andrea G. de Marchi, Arti Doria Pamphilj, Rome; Dr. Hans Otto Meyer, director of Staatlichen Museen Kassel; Ursula J.A. de Goede-Broug, Rijksbureau voor kunsthistorische Documentatie, Garvenhage for assistant information and confirming the attribution. Fine and most elegant painting from the late Italian Baroque. Further details and price on request.